Since 1993 Dizzy Dustin, Young Einstein and Andy “Andy Cat” Cooper like to joke about all mainstreams rappers, who only talk about prosperity. Because for Ugly Duckling Hip Hop is about having fun and not about growing enormous wealth. They do music for the hell of it and since today they follow to the original basics of Hip Hop: turntablism and MCing. Thats why DJ Young Einstein performs his scratches not in the back in order to emphasize his MCs. No – he is the life and soul of the party, while Dizzy and Andy Cat joke about macho posturing and threatening lyrics. 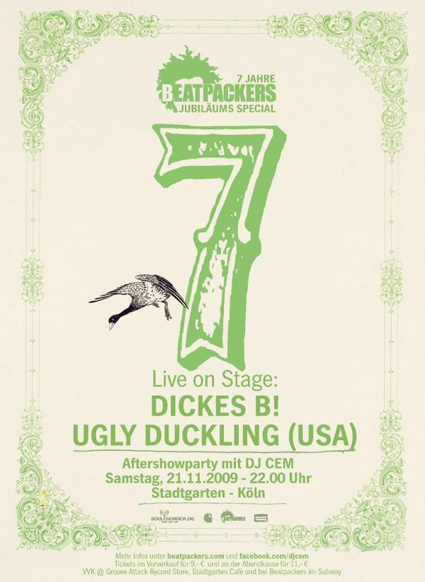 In Cologne the play together with Dickes B, a funky Rap funster from the Rhineland. The right blend for all fans of soulful alternative Hip Hop, who like to party with dudes who got a heart in the right place.